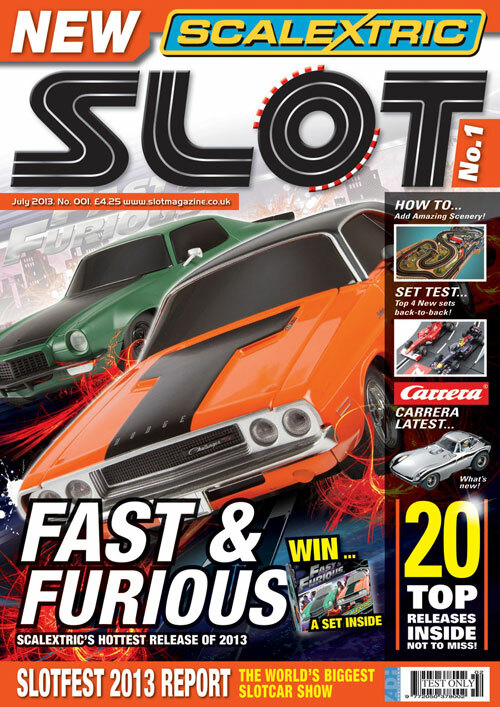 Slot Magazine is a all new bi-monthly (6 times a year) magazine for all slot racing and driving enthusiasts. Covering all aspects of the slot hobby from buying your first set to use at home right through to racing at International level! Every issue will contain the latest information on new products and releases, how toos, race news and the history of slot racing. Look out for Slot in WHSmiths or good local model shops or local newsagents or order here direct from us and be the first to see the magazine each issue and save money! This magazine is long over due and its nice to see some one has realised that slot racing is a national and world sport for big boys and their toys. Having been a race and rally driver and co driver as well as a builder of the real thing its nice to now come down to building and modifying cars that I can put on a small table in the lounge and prepare it for the next race session. I am a member of Presto Park Slot Club who’s owner Mike and several experienced members have shown me what to do and how to get the best out of the model racing scene. With the information this magazine is promising all slot racer should be able to improve their cars and their results. Thanks to the efforts of all who have gone out of their way to produce the one and only magazine in the U.K. for slot racers. Thanks for a really great magazine. I really enjoy reading a magazine I can actually hold instead of just viewing things online like the Scalextric Club has now done. My enjoyment of the magazine was further enhanced today when I found out that I had become the winner of the Fast and Furious set. I am looking forward to receiving it and sending you some photos. Glad you like the magazine Mark. When we called to say you had won a set in our competition it was hard to tell what excited you most – winning the set or getting home to tell your son about it. We hope you both get a lot of fun from it and look forward to seeing a picture to prove it ! Good luck with this new venture Gary! It was nice to see you once again here in South Africa! Hope you had a “lekke” jol! You also raced well on our track! There can never be anough Slot car mags..not that there are plenty..especially here in RSA…so great stuff!